California Yorkie Rescue View other Yorkies for adoption. Chersen is fostered in the Orange County / San Bernardino County area through United Yorkie Rescue http://unitedyorkierescue.org. Chersen is a 7 yr. old, 10lb. Yorkie girl who came to United Yorkie Rescue in April 2017. Chersen was found at a high kill shelter, and as if that wasn't enough, she was left there with mammary tumors. After she came into rescue we sought the best care for her and in May she had surgery, followed by dental care and spaying. Great news followed her surgery, the tumors were benign and she's made a wonderful recovery! Chersen has been on a high quality organic diet, something that will be to her best interest for the remainder of her life. She's such a beautiful, sweet, 'low-key' little girl. We've only heard her bark a total of three times since she arrived. Her tail wags constantly now, showing us her appreciation for every meal, walk and loving touch of our hands. Chersen used to be very fearful of being held and would just freeze until she was put back down on the floor. Now, she likes to be held, but only if sitting in one spot. She still doesn't' like to be carried around, but with time she may adjust. Chersen is trying very hard to leave her past behind and accept 'the good life'. Sometimes her foster mamma wonders if Chersen feels the kindness and love she's been getting is 'Too-Good-To-Be-True', no more being locked in a crate, no more being kicked, hit, yelled at or abused. Time heals all wounds, and we believe this is the case for Chersen. We've known for several weeks that Chersen's continued progress would just take time, and over the past couple of weeks her progress has picked up speed. She is now making complete eye-contact and seeking out attention. Chersen's progress has been so inspiring and heartwarming. She has quickly accomplished our short-tern goals. She is healthy and obviously no longer in pain from her mammary gland tumor, and dental issues. She has learned how to walk perfectly on a leash and is the first one to the door. She comes when called and is spending much more time with the family on her own. Chersen will need a loving and understanding home, a home that is quieter and provides her with the patience, love and admiration she so deserves. 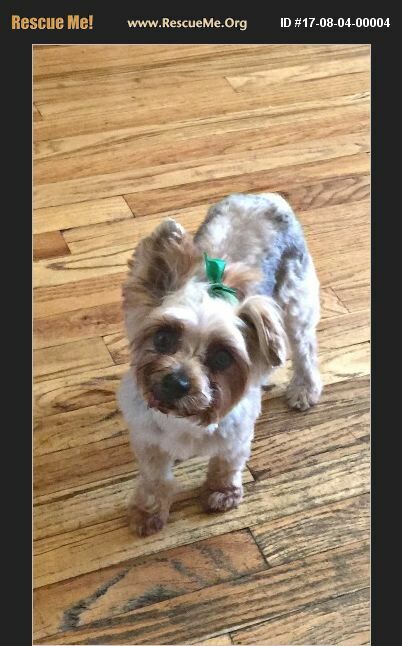 To complete an application for this sweet little one, go to http://unitedyorkierescue.org and click on the application link found in the left side navigation menu. She can't wait to find her forever home!